A 56-year-old lady is on femoral-femoral VV ECMO for bacterial pneumonia and ARDS. She has been transferred to you from another institution. The nurse had been performing some cannula checks when there is a sudden loss of ECMO blood flow. Q1. What is the cause? Air has entered the pump, causing it to “air lock” or stop working. Q2. What is the immediate management? This is an emergency. Many of the management actions will take place simultaneously. Titrate vasopressors/inotropes as appropriate, prepare to commence CPR. Figure 2. Aspirating air from the oxygenator. Q3. Where can air enter the circuit? At any connection or 3-way tap, especially access points on the negative pressure side of the circuit. It is for this reason that it is routine at the Alfred ICU to remove all access points on the negative pressure side of the circuit prior to connection to the patient. Suturing of lines is a risk factor for inadvertent and unrecognised puncture of the cannulae. As the breach point is small it slowly allows air to enter the circuit, unrecognised for some time. Cannulae are also at risk of unravelling with minor trauma. The cannula must be replaced if this occurs. Connections should be made using an underwater seal. 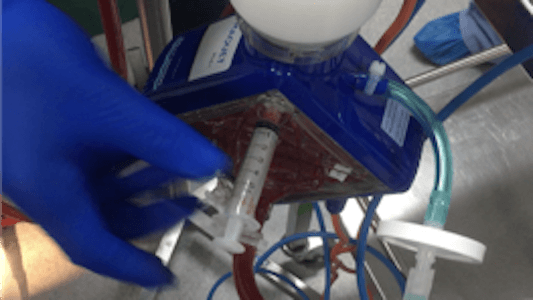 Care should be taken when adding a cannula to the venous system (eg IJV cannula) while the ECMO circuit is still running with access via the IVC. There have been case reports (Lother et al, 2016) of fatal air embolism during percutaneous tracheostomy placement in patients on VV ECMO with an Avalon cannula in situ. These patients were on full support via the circuit in the supine position. The air embolism was within seconds of dilatation. The proposed mechanism was air entering the systemic circulation via the inferior thyroid vein. The access point on the Avalon cannula is in the SVC. Q4. 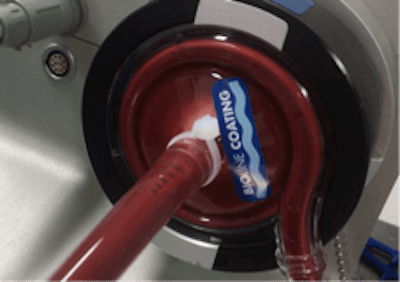 How might air in the ECMO circuit manifest? It may present as a sudden loss of ECMO flow if a large embolism is present – a so-called “air lock”. Q5. What is the pathophysiology of a venous air embolism? Small volumes of air, in the absence of a patent foramen ovale (PFO), can be filtered by the lungs and absorbed prior to reaching the arterial circulation. Large volumes of air essentially act as an ‘air lock’, resulting in reduced blood flow to the left ventricle with subsequent cardiac arrest. The volume and speed with which the air enters the circulation. The rationale behind placing patients in the Trendelenburg position is to allow the air to collect in the right ventricle, potentially allowing aspiration and also in an attempt to allow blood to flow into the pulmonary venous circulation. Q6. What definitive treatments may be required? If initial methods to aspirate the air fail, or there has been a large volume of air entering the circuit, then the circuit must be changed. This should be done immediately and requires assembling a team, equipment, etc, as described in Everything ECMO 012. Ideally, there should be a circuit prepared for such an emergency in your hospital. Note – hyperbaric oxygen is sometimes suggested when massive air embolism occurs on ECMO, but the ECMO equipment is not rated for diving, so this therapy is contraindicated. Pellegrino V, Sheldrake J, Murphy D, Hockings L, Roberts L. Extracorporeal Membrane Oxygenation (ECMO). Alfred ICU Guideline, 2012.